More and more, crisis pregnancy centers are seeing men who suffer psychologically from the effects of abortion. In addition, many pro-life men want to assist these centers but don’t feel comfortable counseling women. 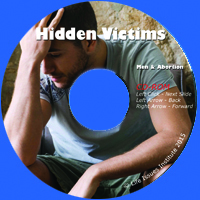 Now tools are available for men to actively counsel men in crisis as a result of abortion. Promoting emotional healing for men who have lost a child to abortion and creating awareness of abortion’s impact on men among the counseling community, pro-life movement and society as a whole. In interviews with three men, host Brad Mattes explores how what seemed an easy solution to an unwanted pregnancy turned out to have long-lasting negative consequences. Watch the show. A half-hour Father’s Day radio special that gives voice to men who are often entirely overlooked on Father’s Day and any other day: men who’ve lost a child to abortion. Listen. Fatherhood Lost. For group Bible study, group counseling or one-on-one counseling. 46 pages. Free PDF download. Missing Arrows. Bible study. 39 pages. Free PDF download. This attractive slide presentation addresses why men are affected by abortion, symptoms of post-abortion stress and how to treat them, and resources for hope and healing. User-friendly CD includes secular and Christian versions. A full script accompanies each version. (Updated 2015; formerly Can You Hear Their Pain?) Order here. Healing a Father’s Heart. Bible study by Linda Cochrane. Life Cycle Books. Redeeming a Father’s Heart: Men Share Powerful Stories of Abortion Loss and Recovery. Kevin Burke LWS, Dave Wemhoff, Marvin Stockwell. Rachel’s Vineyard. Repairing His Story. Four-week counseling program. Chalfont House Publishing. Daily Contentment with God. Daily devotional. Chalfont House Publishing. This entry was posted in Resources for Men by Various. Bookmark the permalink.